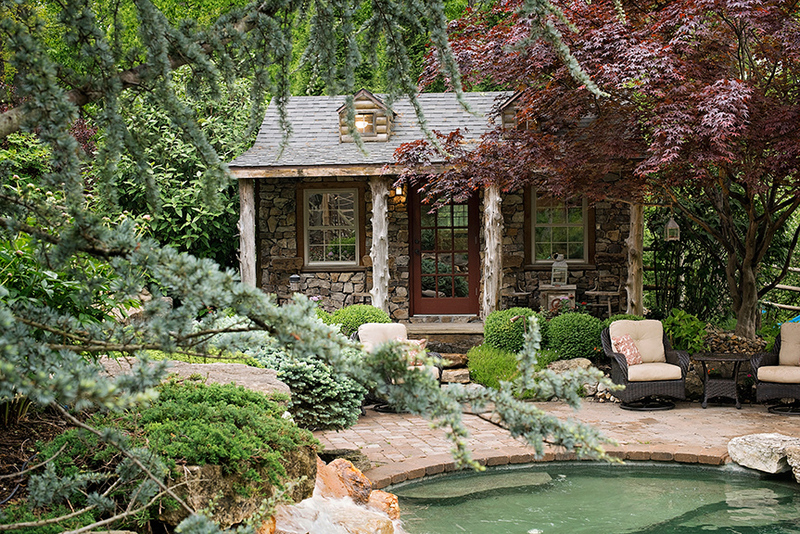 A Wildwood landscape embraces the natural surroundings for a unique, rustic retreat enjoyed by its owners. Over the river (okay, what you ford is really a shallow stream) and through the woods…down a long gravel road that turns into a steep gravel driveway…but what you come to on top of a high hill in Wildwood is hardly your grandmother’s house. 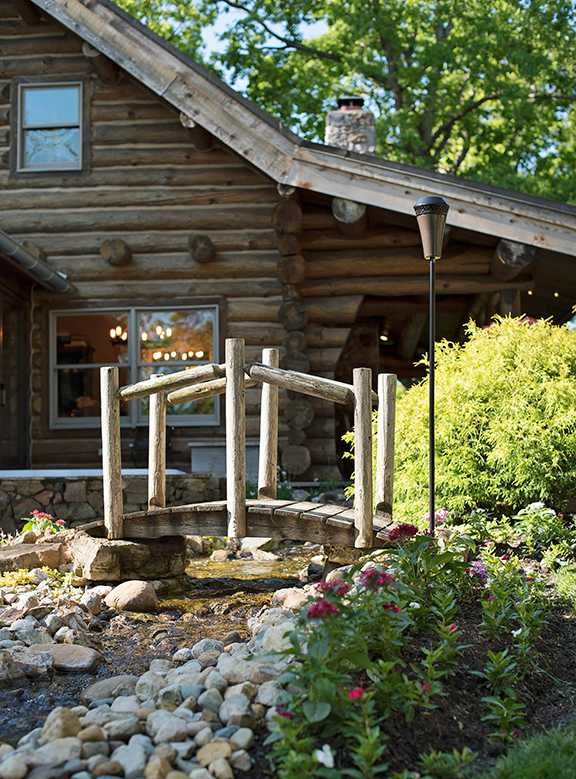 Granted, there’s a log residence and a small stream splashes right past the front door. But a huge, stone-paver parking pad that doubles as a mega patio complete with comfortable, outdoor living room-style furniture fronts the house. To even get into the house requires crossing a wooden bridge…think drawbridge and moat on a small scale. 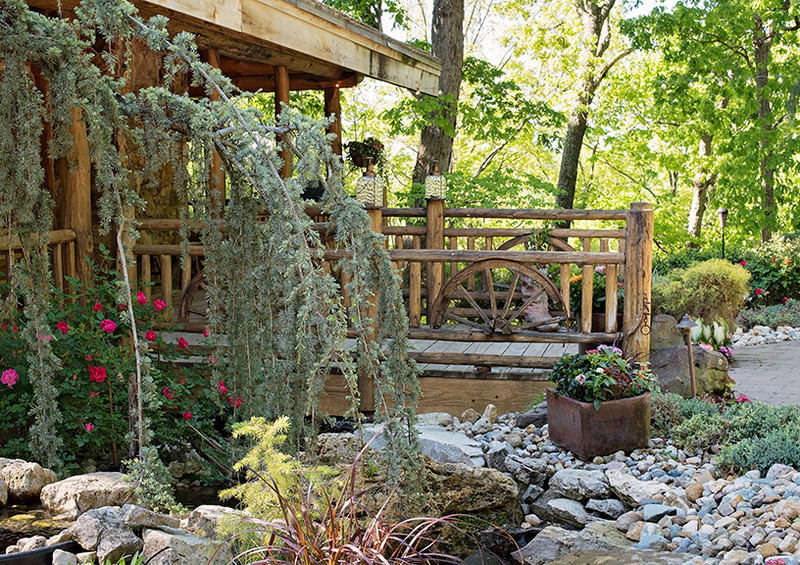 Past the bridge, a porch wraps around the house and provides views into the woods. The pillars supporting that porch arise from a pond tied into the stream. 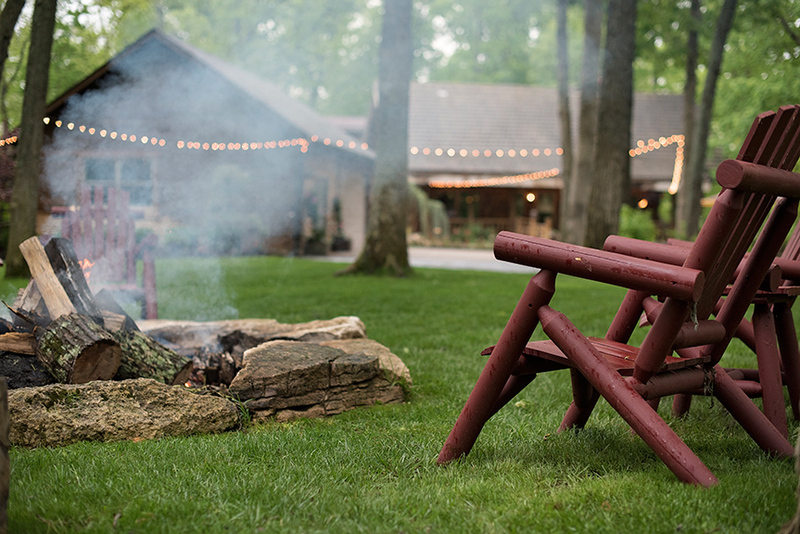 The view is one of rustic, mountaintop luxury. And there are pathways luring you around the side of the house to explore what might be around the next bend of this astonishing landscape. 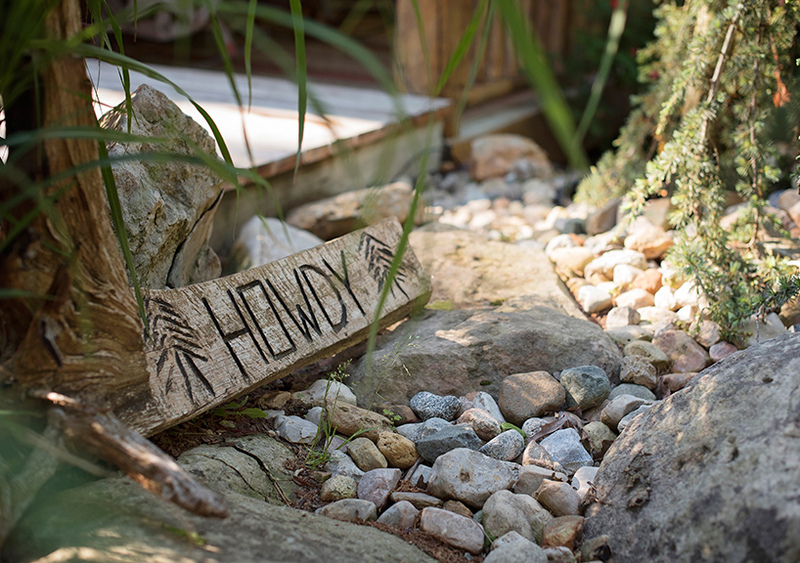 The effect on a visitor is exactly what the creator Eric Ringhofer, lead landscape designer for Green Guys Landscape Design and Construction Company, was hoping for when homeowners Dan and Melinda asked him to take on the project eight years ago. “I wanted to draw people in and have them walk around and ask, “Where does this go?” he says. That such a stunning landscape would and could be created in this remote location is a surprise in itself. It began with a dream in the minds of Dan and Melinda, even before they were married. “I was looking for property everywhere,” says Dan. “When I found this, the log house, which was built in the 1980s, was here but it had been empty for a couple of years. Bats and raccoons lived inside. 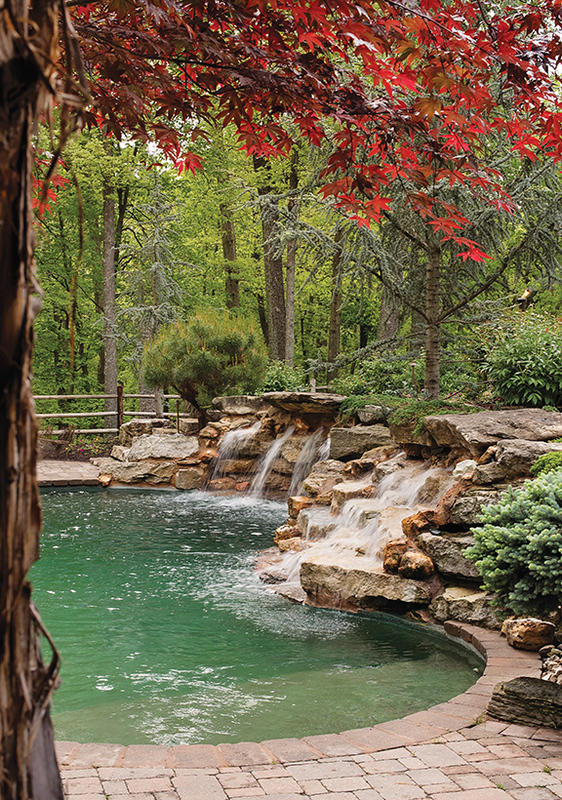 But I liked the outdoor space and the privacy” afforded by the 10-acre property. 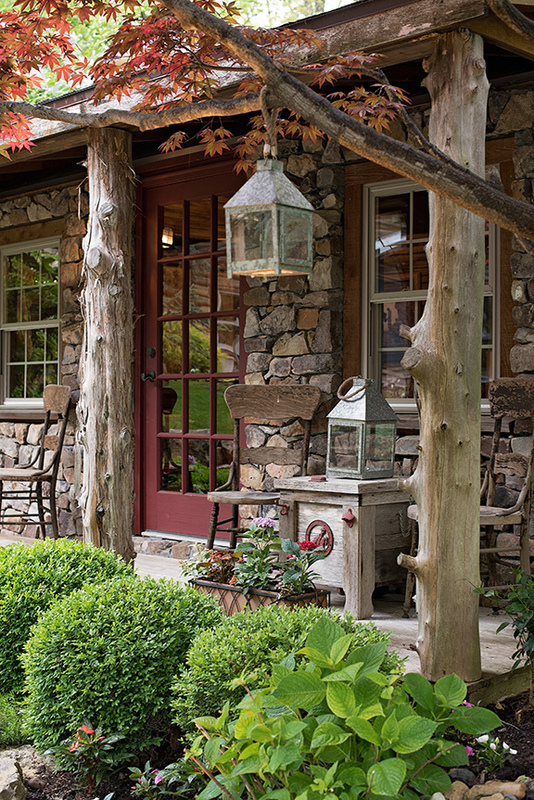 Once they evicted the four-legged residents, the couple re-oriented the interior of the house, added a master suite, created a sunroom/screened porch using reclaimed barn wood and also got married. They addressed the hilltop surrounding the house by giving Eric some general directions. They knew they wanted space for large gatherings. “I grew up in Chesterfield with five brothers and sisters,” says Dan. “When we get together, there are a lot of people.” The couple also hoped to have a large family of their own. “I wanted space for several, active kids,” he adds. In addition they also wanted small, intimate spaces so they could enjoy the outdoors when only one other couple came for dinner. “I took those ideas and ran with them,” says Eric. Clear from the beginning was that this landscape, perched at the highest point in the surrounding area, was not going to look like a “typical suburban layout. With this piece of property, we were able to do things we couldn’t do anywhere else. It was all about creating a series of viewpoints ” to take in the natural surroundings. One of the first steps was simply to grade the area, erect a tall retaining wall to create some flat space and set off the landscaped property from the surrounding woods. 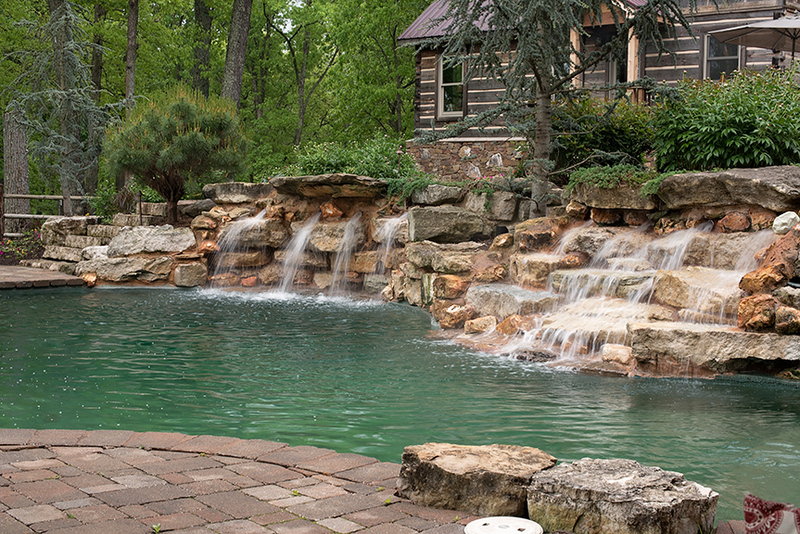 The retaining wall also serves as a barrier to prevent deer from having access to the swimming pool that is now a part of the landscaping. Throughout the process, Eric’s goal was to create a series of gathering spots that, while separate, were all connected. “All the spaces are joined in some way,” he points out, and water is the constant. “You can always hear the water and see it running through the landscape. I also wanted to create a sense of mystery; an element of surprise. There are several views from the house where the pool area is hidden. 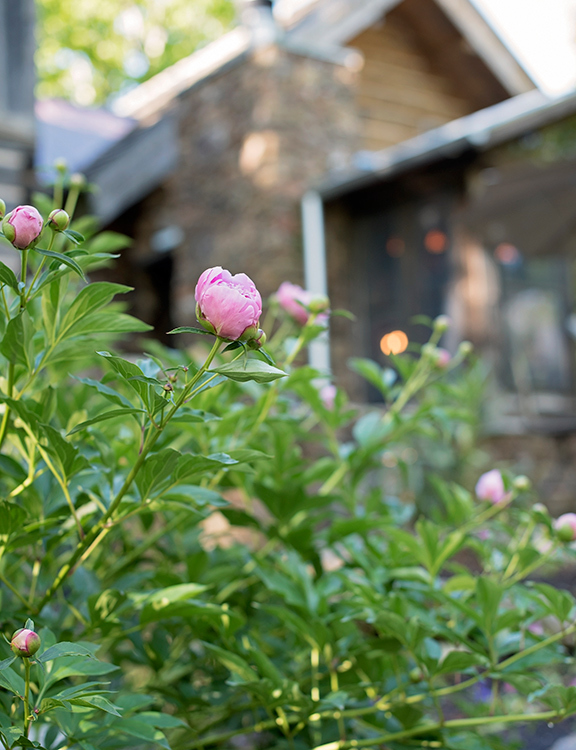 “This is not a suburban yard or a residence you can stuff with annuals. You have to have a lot more structure to pull you through,” Eric continues. But in creating that structure, “there is a fine line between making it look like something from an amusement park or like something that has been there forever” and is part of the natural landscape. 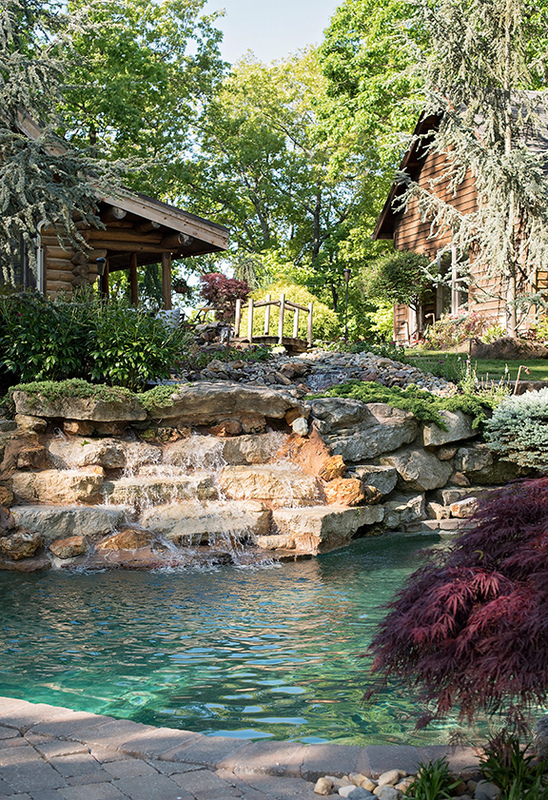 To give Dan and Melinda’s landscape the “forever” look, Eric created three separate water-flow systems that can work together or individually. In the winter, the pool can be shut down, and the other two systems that flow around the house can be left on,” he explains. 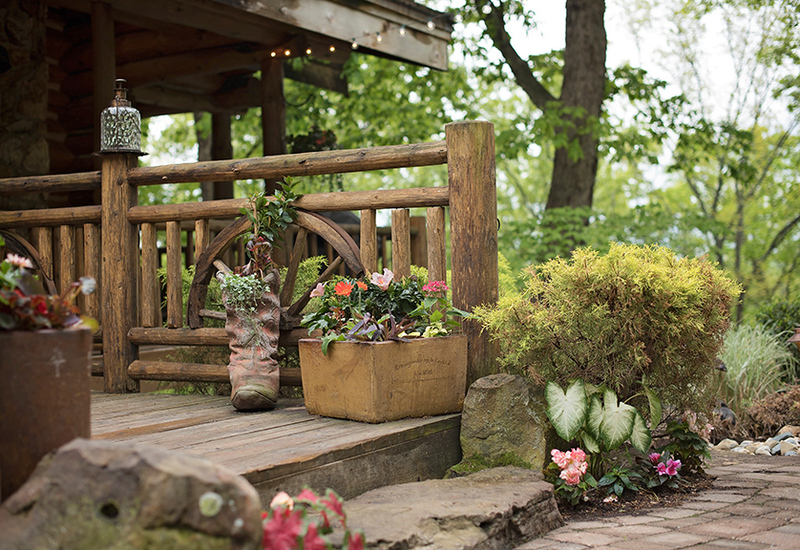 Eric, Dan and Melinda also strove for a natural, been-there-forever look in the landscaping surrounding the house. Because of the rustic look of the house we “went a bit Alpine” using Alaskan blue spruce and Blue Atlas cedars, Eric notes. 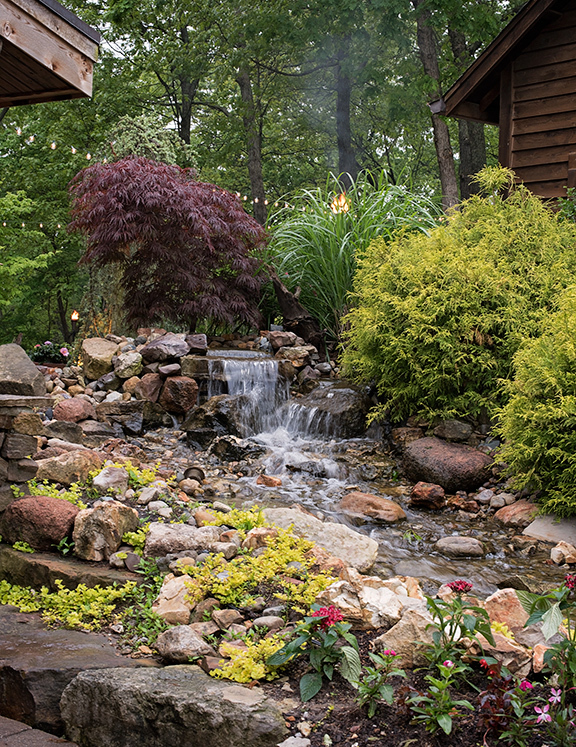 While they added some hydrangeas and Japanese maples, they are always cognizant of the ever-present deer in the surrounding woods and have kept things natural by emphasizing dogwoods. Hordes of daffodils, poisonous to deer, greet spring rather than tulips, “which they eat like ice cream.” Dan and Melinda rely on lush green turf and mature trees to create dramatic lawn areas adjacent to the house. “You can’t make this too much of a perennial extravaganza because of the deer,” Eric notes.